Triple chrome plated brackets with high-temperature plastic separators keep plug wires away from exhaust manifolds, headers and other trouble spots. 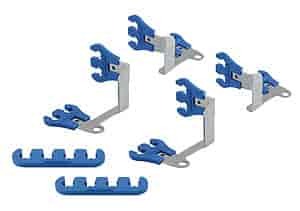 Prevents ignition crossfire by keeping wires evenly spaced and are available in a variety of styles to suit any wire routing need. Note: Unless otherwise noted, Moroso wire loom kits hold 7-9mm wire as delivered. All wire loom kits may be modified to fit wire up to 11mm or Moroso Sleeved Wire.